Mission Statement The corporation is organized and shall operate for educational and charitable purposes. The goal of the organization is to develop an artists' community and foster interest in the visual arts by encouraging area artists and the community through education, exhibitions and exploration of the arts. Services and Projects The Artists' Coalition has a number of art exhibits throughout the year. They are the members theme show, a new juried show, art critique events and our Open Studios. We donate a percentage of our Members' Show Silent Auction proceeds to a local non-profit each year. We, also, have a scholarship program for art students graduating high school and going on to a college art program. The Coalition's Art Mentor Program matches a number of our artists with junior high students from West Sedona School, one-on-one, each year. We conclude each year with a group show for our mentor students. We have also done this with Red Rock High School students in past years. At our meetings, we encourage our artists to network with each other and other artists in the community. Also, art professionals come to our meetings to talk on the many aspects of being a professional artist in the art world today. 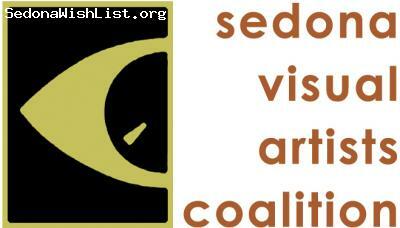 The Artists' Coalition holds a couple meetings a year at well respected artist's studios in our community. Meetings are always open to the public. Description: Opening night of inaugural juried show. Description: Our members party hearty. Description: Silent Auction Chair, Patty Miller, Unmasks at Opening. MENTORS to work with these children to help them create and sustain their self-confidence. Also, we would love WORKSHOPS for them to assist these teenagers in working together and expanding on their individual work. Supplies $100 and Stipend $100 ( Negotiable ). ( maybe West Sedona School also ); Demonstate or Talk about your art work; $50 Stipend. WE WANT WORKSHOPS : West Sedona School & Red Rock High; One or Two Sessions; Supplies $100 and Stipend $100 ( This is negotiable ). with Junior High Students. A real two-way experience. Supplies $100 and Stipend $100. A LOT OF FUN & A LOT OF HELP! Continue Home-School Mentoring. $100 Stipend plus $100 Supplies.